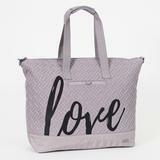 Another deal from Lug today – spend $100 and get a free Aerial Love Tote. The bag is valued at $99 – and you also get free shipping on orders over $100. Deal is valid today only – the deals expire at 11:59pm est.